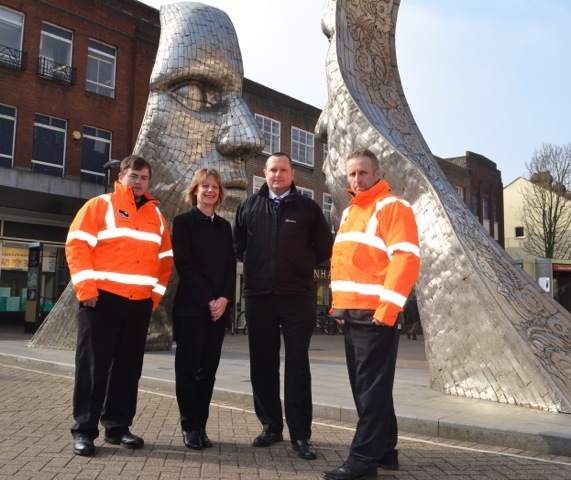 As part of its mission to keep Bedford town centre safe during the day and night, BedfordBID is the main funding partner for the High Street Taxi marshall scheme. Operating in partnership with Bedford Borough Council this scheme provides an important and valued service for both residents and visitors to the town. Two marshalls are on duty each Friday night, and three marshalls on Saturday night, from 11.30pm to 4.00am. Their role is to ensure that only legal and registered hackney carriages and private hire vehicles are operating within the town centre, as well as maintaining an orderly queue for the taxis throughout the night. They work closely with pub and club door staff, as well as the Police and CCTV team to keep the High Street safe and orderly. The Taxi marshalls are a highly valued service in the town centre. BedfordBID is committed to attracting new customers and visitors to the town centre, both during the day and at night, and by making people feel safe we're helping to make them feel welcome.